Detroit native Jessica Care Moore is a poet first. But it is that very gift that has guided her hand in becoming a playwright, producer, performance artist, activist, Def Poetry Jam contributor, and hip-hop collaborator. 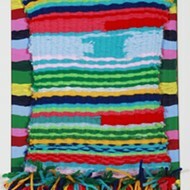 Over the course of her career, Moore has uniquely merged her poetry, music, and visuals for a deeply personal mosaic of conceptual projects, several of which have garnered national attention. For this event, “Poetry and Beautiful Men on Guitars: A Night of Rebellion Poems & Experimental Duets,” Moore will team up with the likes of Kenny Watson, Sean Blackman, John Bunkley, Omar of One Freq, and Duminie Deporres. Jessica Care Moore performs on Thursday, Jan. 4th at MOCAD; Doors open at 8 p.m.; 4454 Woodward Ave., Detroit; 313-832-6622; mocadetroit.org; Tickets are $10, $5 for members.